1. تجعل المتصفحات تفتح أسرع بـثلاثة أضعاف. 2. تزيد من سرعة التصفح. 3. تزيد من سرعة تجاوب المتصفح وسرعة التعامل مع المحفوظات. 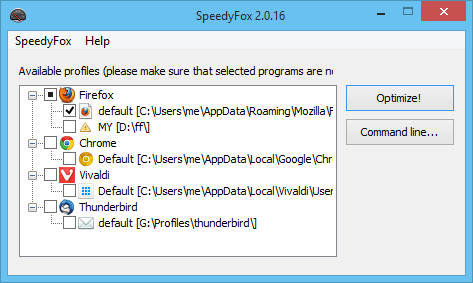 SpeedyFox is a brand new small utility that allows you to boost Firefox, Skype, Chrome, Thunderbird in a single click absolutely for free! Firefox (and sometimes it’s add-ons) uses SQLITE databases to store lots of its settings. By the time the databases grow and Firefox starts working slowly. It will take a lot of time to load during startup, the overall speed will be effected, and browsing Histories will be too slow. This is very common problem and it occurs largely because of fragmentation of databases. SpeedyFox compacts those databases without loosing any data. Databases are optimized to operate faster and are decreased in size. After you optimize your Firefox, Skype, Chrome, Thunderbird with this tool, you will get a fresh newly-installed feel because the speed indeed gets considerably faster. You will get up 3 times faster startup speed, browsing history will become faster, and performing operations with cookies will be quicker than before.